Engineering of biocatalysts with the help of immobilization techniques is a worthy approach for the advancement of enzyme function and stability and is finer to the other chemical as well as biological methods. These biocatalysts encapsulation methods actually use very gentle method conditions that hardly affect biocatalysts internal specific biocatalytic activity and this leads to its internment without losing its freedom but restrict the movements related to unfolding. Additionally, enzyme encapsulation somehow imitates their mode of normal incidence within the cells and it also provides secured surroundings for enzymes to the operating parameter changes. 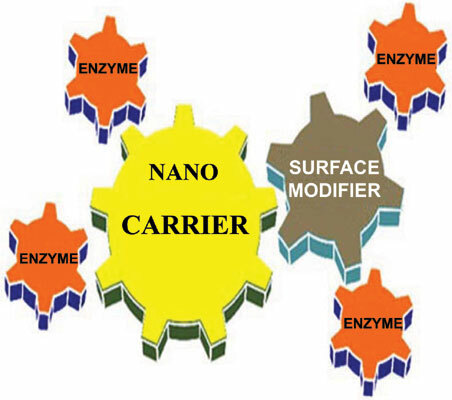 According to these advantages, enzyme encapsulation finds enhanced applications in a wide variety of fields such as medicine and sustained or continuous release delivery systems, biosensing, clinic diagnostic, biocatalysts in the manufacture of high-value yield correlated to pharmaceuticals especially in cancer cure, fragrances as well as flavors. This review mainly focuses on the current status of enzyme immobilization using nanocarriers, nanoparticles or polymeric matrix materials, which aim to summarize the latest research on the natural polymer, chitosan based nanoparticles in various enzyme immobilizations. Immobilization, nanotechnology, biocatalyst, enzymes, chitosan nanoparticles, pharmaceuticals.